Sari Sadik Baba is visited by the Greek infidels too, for they say that "this is our Saint Nicholas." By giving their offerings to the keepers of the tomb, they make their visits to him. None of the authorities have been able to root this practice out absolutely. Once, when this saint wished to cross from the city of Vostitza to the Bay of Naupaktos, opposite, the sailors started across without taking him into the boat. Sari Sadik Sultan then gathered a little sand from the seashore into the skirts of his robe and walked onto the sea after the boat, scattering the sand grain by grain. The sailors watched, and as the heart-wounded dervish came on, filling up an area extending for two thousand paces, they became panic-stricken lest the saintly dervish should fill up the entire sea this way, and by closing off the gulf, deprive them of their place of work. So they called out, "Come and get in the caĩque, Old Father," and taking him at once into the boat, ferried him across to Naupaktos. For this reason, there is a mile-long sandy point on the Vostitza side of the gulf. This, then, is Sari Sadik Sultan, holiness be upon him, who lies at rest in Patras, and to bring his holiness to its fullest visibility, he has been transported to Heaven. We were having a drink under the platan trees by the trout ponds in Naousa. A man joined us, we exchanged introductions, and he said, "You think you are scholars and you know everything about history. But you don't know what really happened to the Library of Alexandria." And then he explained that the library had never burned, as everyone assumed, but that the Pope had taken it away, and all the priceless Greek manuscripts were locked away in the Secret Archives of the Vatican. This sounded like good news to us: it meant that priceless manuscripts still survived, but for him it was the crowning proof of papal perfidy. Considering the Fourth Crusade and Ferrara-Florence, a fragile case might be made for his view, but not here. It might be thought a bit of perfidy that Alexandria had some of its Greek manuscripts at all. Ancient Athens required that a copy of each play presented at the Dionysia be deposited in the Metroön, the building that housed official city archives. That would have been nearly 400 plays collected across the century under which the system of drama was maintained. A hundred years after that century was over, Athens became involved in the Chremonidian War, an effort of Greek states to throw off Macedonian control. Athens was not what she had once been, and asked to borrow war funding from Ptolemy II of Alexandria, who agreed in exchange for receiving the complete collection of plays as pledge on the loan. In an act that can only chill the stomach of anyone who has sailed in the Mediterranean, Athens put the manuscripts of a thousand plays on a galley and sent them across the water to Egypt. Ptolemy sent the money. In time, Athens asked to redeem the pledge. Ptolemy, in effect, said, "Keep the money." More history happened. In the course of Julius Caesar's siege of Alexandria in 48BC, warehouses in the harbor area in which books were stored caught fire. There was much outrage about burning the library -- if the books did indeed belong to the library. A patriarch named Theophilos is said to have burned the library in 391 AD on the grounds that if the books contradicted Holy Writ, they should be destroyed, and if they agreed with it, they were extraneous and unnecessary. In 640, the Calif Omar took over the city of Alexandria and when asked what should be done about the library, made, by the most amazing coincidence, the same response as Theophilos. These burnings of the library cannot be demonstrated to have happened although there were burnings, and in the course of conquests and revenge books do get burned. There may have been other burnings that did or did not happen. The real problem is, we cannot establish that there was actually a Library of Alexandria in the time of Caesar, let alone by the time of Theophilos or Omar. What we do know is that over the course of the 8th and 9th centuries, mathmatical and medical documents from Alexandria ended up in Persia. And we know that Egyptians took manuscript rolls, sliced them like jelly rolls into little strips, and wrapped their mummies with them. Most of the Sappho that exists today comes in partial lines from fragmented ribbons of mummy wrappings, although not the poem above. 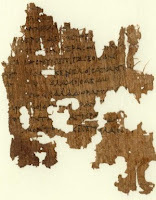 In that fragment neatly copied on papyrus, Sappho says to a group of young girls that they have the gifts of the Muses, and ends by saying that, being human, there is no way not to grow old. Cleopatra of Egypt, who loved Caesar for a while and could not have loved a book-burner, given the choice, would have gladly responded to that with her famous "Make it so!" Rossini's opera, The Siege of Corinth--L'assedio di Corinto, is not an experience to be undertaken lightly, say, the way one would go blithely to one's seventeenth or twenty-seventh performance of Barbiere. Even when it was written, in 1820, audiences stayed away in droves, possibly because it was entitled Maometto II, somewhat lifted from someone else's opera, and possibly because it was pretty awful. It is true that after the capture of Negroponte, the women, children, and boys under the age of 18, were taken off as slaves, but there never was an Anna Erizzo. The Venetian commander Paolo Erizzo was killed before dawn on the final day of the siege. All men of military age, about eight hundred, were beheaded after the capture. More had been killed, a few escaped. The loss of the women and children was its own tragedy, and documents survive of men like Eustachio who, although able to track down and ransom his wife and some of his children, was grieving ten years later for the two daughters still missing. But with the exception of Dialogues des Carmélites, tragedy in opera is not like tragedy in real life and Anna needs little sympathy. Six years after Maometto flopped, Rossini reissued it in French, and with ballets, as The Siege of Corinth (which Maometto had beseiged, briefly and without violence in 1458). It was an immediate hit. Europe had been following the 1826 siege of Messolonghi (where Byron died of malaria in 1824) and the massacre there of the women and children who had tried to escape. There had also been the 1822 siege and massacre at Chios. In the vestibule of the Senate palace, the men of Corinth are ready to defend their city (“Signor, un sol tuo cenno”), but Cleomene, the governor, tells his people that their situation is hopeless: the Turk Maometto II refuses to relent in his siege of the city (“Del vincitor superbo di Bisanzio”). As the men march off to fight, Pamira and the women pray again, readying themselves for death (“L'ora fatal s'appressa”), even as the Turks are heard exulting in victory. Maometto enters triumphantly hoping at last to gain Pamira, but she threatens to kill herself if he approaches. With a roar, the building crumbles, revealing the city consumed in flames, as the Turks slaughter the people of Corinth . This time the opera worked, audiences wept in droves for tragic oppressed Greece, and everyone, especially Rossini, was quite gratified. Looking to the north, you can see where Nicolò da Canale sat with the Venetian fleet that August, out of danger, but not out of the sound and sight of the besieged. 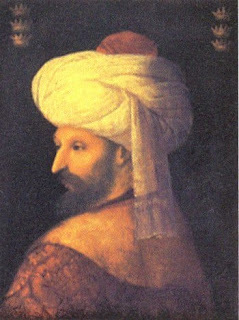 Mehmed-Maometto was besieging Negroponte as vengence for da Canale's stupidly gratuitous siege and massacre of Ainos in 1468. 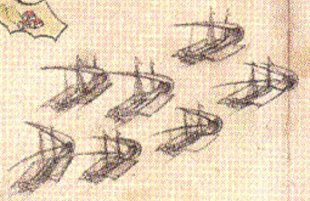 But da Canale's Negroponte behavior duplicated what happened earlier, when the Venetian fleet waited off-shore at Patras in August 1466 and so enabled the slaughter of Jacopo Barbarigo and his troops, and the impalement of Michali Rallis. So wrote George Seferis, returning to myth the nearby cliffs of Cape Skyllaion, Cavo Schillo, Cape of Dogs--the cape close to the channel of Poros, almost directly south from Athens. Its name comes from a girl who behaved so badly it is difficult to think that 'dog' is not a euphemism for a closely-related word, but the Cape of Dogs is a node for a cluster of small images. The name comes from Ovid's story of Scylla, daughter of Nisus of Megara who was known for his lock of purple hair. Apollo visited their castle once, and rested his lyre on the stones, and when Scylla was a child she could set the stones singing by tapping them with a pebble. But her father was for six months beseiged by Minos of Crete and Scylla became enamoured of the heroic armored figure she watched from the walls. One night, she cut off Nisus' purple lock, the secret of Megaran security, and took it to Minos, offering him victory and herself. When Minos rejected her in horror--the victory he was not free to reject was definitively his--the obsessed girl swam out after his ship and clung to the stern. Her father, transformed into an osprey, tore at her until she was transformed into a shearwater -- named for the shorn lock of hair. Pausanias's more sober version says that Minos had her thrown overboard, and her body was torn by sea birds where it washed ashore on the cape. 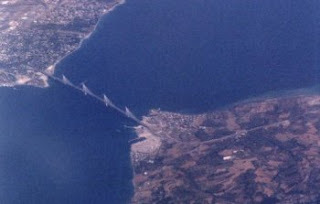 There are too many elements here that do not bear up under scrutiny, but the cape, true to Ovid, changed its number of dogs, its location, its shape, and even its location for on occasion we find Ottoman and Venetian sources that sometimes refer to the cape down by Spetses, as the Cape of Dogs, and sometimes the cape by Poros. Piri Re'is rounded the Cape of Dogs many times in his career--that is his unfinished sketch of galleys above. He wrote of sailing for the cape and finding the Venetians in possession of the small port of Poros. The channel between Poros and the mainland is so narrow that it seems as if fully-extended galley oars would smash on either side. It was night and no retreat. Piri Re'is had his oarsmen muffle their oars and the galley slipped silently through the channel on the current and down past the cliffs of the Cape of Dogs. As I did one morning as dawn broke. The boat had turned off its engine and as we drifted through Poros in silence, I saw illuminated in the rays of sun on the horizon, a woman in a white gown on a balcony, bending over to brush the long hair that hung to below her waist. In that misted early sun, the stones had been set singing. For the poem, see George Seferis, Mythistorema, Part 4. Trans. DW. 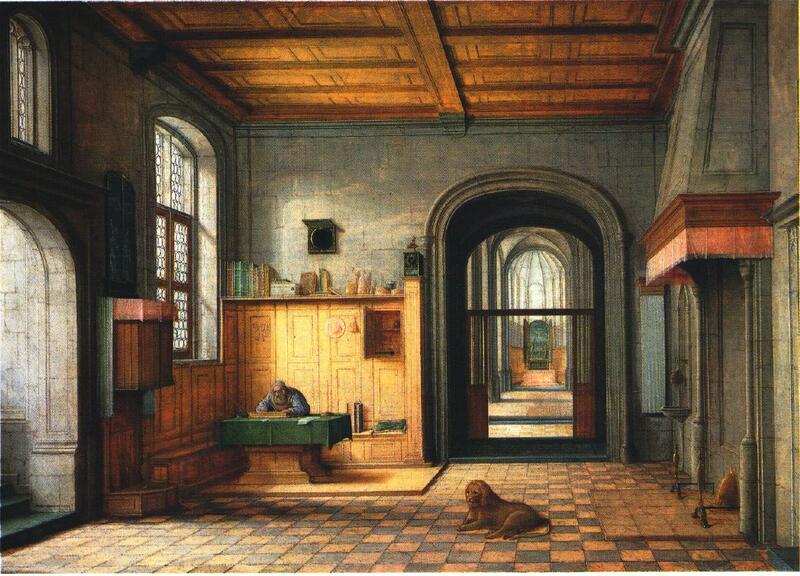 There are a lot of studioli in paintings of St. Jerome because he was a scholar and scholars need privacy to work. The studioli are small wooden studies, such as you can see here, a small room inside a room, or a panelled side of a room, with raised platforms to keep feet off the cold floor, nearly all with sliding piles of books, and hourglasses and pens and inkwells, more books on the floor, books toppling over in cabinets, reading stands, writing stands, astrolabes, green baize or Turkish carpets for table covers, high-backed seats to keep the draft off, prayer beads, vases, pots of flowers, a pear for snacking, scissors, glasses, notes on bulletin boards, cardinals' hats (because that is half of how you identify Jerome), clocks, birds and shells, antlers and squirrels; peacocks and quail--because scholars study nature. The other half of how you identify Jerome is his lion--lions like kittens, lions like stuffed animals, sometimes Jerome looks like a lion, lions like old dogs, and in Durer's along with a dozing lion there is a sleeping dog, because wise men who are scholars have white dogs, in contrast to old wise women who are witches who have black cats. The best known of these white dogs is Carpaccio's Augustine, but that painting is about Jerome, too, because Augustine in his wonderful study--far grander than a studiolo--has abruptly had a vision of Jerome in death. Both of those last two wise men with white dogs are intended as portraits of Cardinal Bessarion and Bessarion is the explanation for the astrolabes that appear in Carpaccio's Augustine, and in occasional paintings of Jerome. The astronomer, Regiomontanus, made an astrolabe for Bessarion, and Bessarion, like Jerome, was a Cardinal. Most of these studiolo paintings bring you close in to the studiolo with Jerome, give you that wonderful enclosure, but the painting by Antonello da Messina showing an elevated studiolo in a setting something like a church, surrounds Jerome with privacy. In other paintings, the lion is sleeping, or guarding, or holding up his paw to have a thorn removed--at some point the story of Jerome got mixed up with the story of Androcles--and Bastiani and Carpaccio have great fun watching the lion scaring the monks.in the cloister. For Antonello, though, Jeroma has a cat among his flower pots, because scholars tend to work quietly and cats like not to be disturbed. Far off to the right of Antonello's studiolo is the image you see above, an alert gracile lion pacing among the pillars of the cloister as if they were trees. Other studiolo lions might represent the taming of the bestial in man, the triumph of law over nature, the redemption of fallen nature, and so on and so forth, but not this lion. Antonello's lion is a metaphor for scholarship--for the deliberate and watchful stalking of information, for the pacing nature of thought, for the open spaces of the mind, for the easy interchange of views. And because it is Jerome: the lion suggests the possibility of the radical transformation of the culture from which the studiolo protects. For much more, see the wonderful book by Eugene F. Rice, Jr., Saint Jerome in the Renaissance. and a modern architect's recreation.